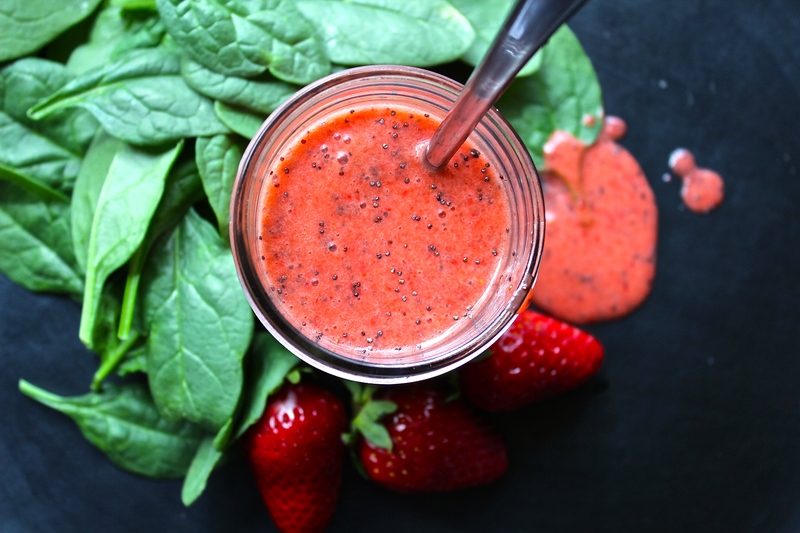 Strawberries have anti-inflammatory powers. They block the same pain-inducing enzyme (called cyclooxygenase or COX) that aspirin and ibuprofen do, but without any side effects. This sweet fruit also tops the list of foods with strong anticancer effects. After my friend, Jonathan, told me that he puts berries in his kids’ salads I was intrigued. And now with this salad dressing, I know we’ll get even more of the good green stuff into our kids (and adults, too). Combine berries, vinegar, honey, and sea salt in a food processor. Slowly add oil until emulsified. Add poppy seeds and stir to mix. Serve on greens with fresh strawberries. On day 33 of this 365 day project, I ate my daily five (including roasted cabbage with lemons). Did you enjoy yours?